An off-duty Department of Defense employee trying out his friend’s drone from an apartment is responsible for flying the unmanned aerial vehicle (UAV) over White House grounds, The New York Times reported. While the drone was airborne, the US government worker – who had reportedly been drinking – lost control of it. He texted his friends, telling them he thought the drone might have crashed onto the White House grounds, and fell asleep. He woke up the next day to find out that his fear had turned out to be reality. The man, who has not been identified, has been cooperating with the investigation and has not been charged with a crime, the Times reported. Flying a drone is illegal in Washington, DC, due to the sensitive nature of the airspace. A spokesman for the National Geospatial-Intelligence Agency (NGA) confirmed to the newspaper on Tuesday that the Secret Service had questioned a government employee the day before in connection with the drone episode. Secret Service investigators were trying to verify the employee’s account of the situation as of Tuesday. They were also examining his text messages and phone records, as well as analyzing video footage from cameras around the apartment where the man said he had operated the drone. What the incident has revealed, however, is that despite the White House having a radar system to detect flying objects, it missed the drone. This is causing authorities to worry about security risks posed by unmanned aerial vehicles. The small drone, a DHI Phantom, was detected when a Secret Service agent was patrolling the grounds on Monday morning and saw the drone flying at a low altitude. It crashed onto the lawn where it was recovered by agents. 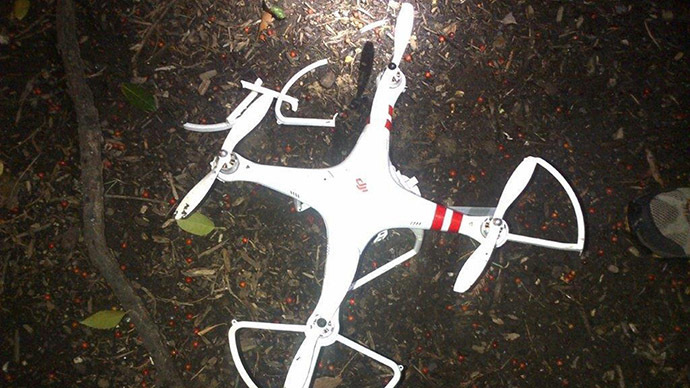 The drone incident is the latest to raise questions about the security of the White House. It occurred four months after a man with a knife climbed over the White House fence and made it deep inside the building before officers tackled him. In 2011, a gunman three-quarters of a mile away from the White House fired shots that hit the building while one of President Barack Obama’s daughters was home. The Secret Service’s director, Julia Pierson, resigned in October after a number of security lapses. A critical report released in December found the agency is stretched beyond its limits, is too insular, and is “starved for leadership.” Five agency managers were removed from their positions in January as a result. In India on Tuesday, President Obama said the United States needs to regulate the drone industry. "The drone that landed in the White House you buy in Radio Shack," Obama told CNN’s Fareed Zakaria. "You know that there are companies like Amazon that are talking about using small drones to deliver packages...There are incredibly useful functions that these drones can play in terms of farmers who are managing crops and conservationists who want to take stock of wildlife. But we don't really have any kind of regulatory structure at all for it."